In 1992, the Southeastern Conference added the University of Arkansas, giving the league 12 teams. The SEC then divided itself into two divisions, and created a need for a an SEC championship game. And for the majority of those 17 seasons, at least one team has entered that game with a legitimate shot at playing in the national championship game. This year, for the second straight season, both teams enter the game with the knowledge that if they win they will play for the national championship in January. And once again, those two teams are Alabama and Florida. But there are other games on the docket this weekend as well, including a full slate of NFL games. Here is what’s on tap for this weekend. 1. The SEC Championship Game is at 4 p.m. on Saturday and will be must see viewing for any college football fan. 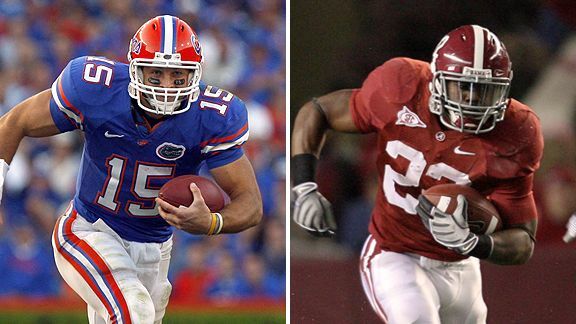 Tim Tebow (top left) and the Florida Gators will be taking on Mark Ingram (top right) and the Alabama Crimson Tide for the SEC title as well as a spot in the national championship game. These two teams met in the SEC title game last year, with Florida pulling out the victory and securing a place in the national title game (a game they eventually won against Oklahoma). Alabama has been waiting for a full year to avenge that loss, and we think they’ll do just that. But it should be a good game down in Atlanta on Saturday. 2. The SEC championship is not the only game on the schedule this weekend, as the Big 12, ACC, and Big East will all have their champions crowned on Saturday as well. In the Big East, Cincinnati will take on Pittsburgh with the winner likely going to the Rose Bowl, although the Bearcats still have an outside chance at playing for the national championship. Texas will take on Nebraska in the Big 12 title game. A win by the Longhorns would put them into the national championship game against the winner of the Alabama-Florida tilt. And finally Georgia Tech will take on Clemson in the ACC championship game. 3. There is a full slate of NFL action on Sunday, but the big games feature the Philadelphia Eagles travelling to Atlanta to face the Falcons. Philadelphia back-up quarterback Mike Vick was a star in Atlanta prior to his dogfighting conviction, so it will be interesting to see how he is received if he gets into the game. The Dallas Cowboys will face the New York Giants in a game that could very well decide the Giants’ fate. And the red-hot Tennessee Titans (winners of their last five games after an 0-6 start) will face the undefeated Indianapolis Colts in a game that will determine whether the Titans can continue their miracle run towards the playoffs. Okay, that’s it for this week. Follow us on twitter at acasualfan for updates throughout the weekend and also, click here to see how to become a fan of ours on Facebook or to find out how to send us an e-mail (we love feedback). See ya Monday. Class dismissed.